Ryan was working in finance as an accountant when he realised it wasn't a profession in which he saw himself in five years time. He switched to UX, and hasn't looked back since. Ryan Yang seemed destined for a career in the financial industry. Armed with a Bachelor of Science in Accounting and Finance, he took his first job at a large accounting firm - but there was a problem. The work he was doing just didn’t align with the future he envisioned for himself. Bored and unfulfilled, Ryan grew more and more restless. He knew he needed a change, but was completely stumped as to what direction to take. It wasn’t until he bumped into an old friend that he discovered the world of UX - and had a conversation that pretty much changed his life. What made you consider a career change? After a year of toiling away in public accounting, I realized that what I was doing was not aligning with where I envisioned myself in the future. Over time, the work that I did became more monotonous, repetitive, and suppressive of free thought and creativity. I also became aware of the threat of automation taking regulation-based jobs - so not wanting to be out of a job in a few decades, I decided to imagine the world decades down the road instead of seeing the world at face value as it is now. I did a lot of research and drew my conclusion that the tech field is where it’s at. 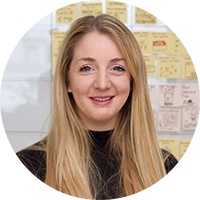 What initially sparked your interest in the UX Design course? I had actually never heard of the field of UX until one of my best friends met up with me one night at a college reunion. By then, I had already decided on switching careers into something more creative and tech-based but didn’t know exactly what. My friend had the patience to stay after and listen to my frustrations on my current job and my plan to go into software development as a coder. This same friend actually took the CareerFoundry UX course a year back and explained in detail what he did now as a UX designer. When I got home that night, I stayed up doing a ton of research about UX and realized that it was at the crossroads between philosophy, technology, business, empathy and creating the cutting edge of human-centered interactivity. I realized that studying UX meant not having to start over in a completely different trajectory. Instead, I could step into the tech industry with my existing business skills and pick up new ones at my own pace. Why did you decide to take a bootcamp course? Interestingly, my friend had a positive experience learning UX within the CareerFoundry program and recommended it to me. I did my research and realized that it was a much faster way to learn and a cheaper alternative to going back to college. After spending most of my life in school, going back and starting over didn’t make much sense to me. With a lot of deliberation and research, I decided to enroll as well. This was around the time that I left my job near the end of the year to go on a trip to California with my friends. I probably did things the opposite way, and wouldn’t recommend quitting your job prior to getting a new one in a field you love! But I wanted to plant both feet firmly through the door instead of having the luxury of looking back and hesitating. I had my “crossing the Rubicon” moment - which took a lot of courage, but I really felt a strong calling to the world of UX. When I came back from California with a fresh perspective on life, I started the bootcamp with the utmost hype. Funny enough, my tutor in the bootcamp turned out to be the very same friend who guided me through this whole process; Abhishek - the hilarious yet classy college buddy of mine now becoming my teacher. The world works in funny ways sometimes. What I enjoyed the most about the course was having free reign over the quality of my bootcamp experience - what you put in is what you’ll get out of it. Every morning, I would get up and read a section of the course, highlight notes and read all the attached articles about best practices and really important tips. Then I would proceed to try my hand at designing things. This was the most fun part, and designing became more natural as I progressed along through the course. Which aspect was the most useful or interesting? I think one of the most important parts of the CF program is the unified community of like-minded individuals all in the middle of bettering themselves and working on their own career change. It creates this social web of support where anyone can reach out at any time for guidance, feedback and help. I started out new and overwhelmed at first, but seeing how supportive everyone was then and now is definitely something that I really appreciate. I’ve made a lot of tangible connections and friends with current students and past alumni this way, and see tremendous value in it. What were the next steps after you finished the course with CareerFoundry? After I graduated from CareerFoundry, I spent a few weeks revamping my resume and online profiles and started applying for UX jobs in earnest. I also re-read the entire UX program contents and created notes for future reference. How did CareerFoundry, and your new qualification, help you get a job? CareerFoundry taught me what I needed to know to get started in the world of UX, and provided me the guidance to create a tangible portfolio piece to showcase to potential recruiters. 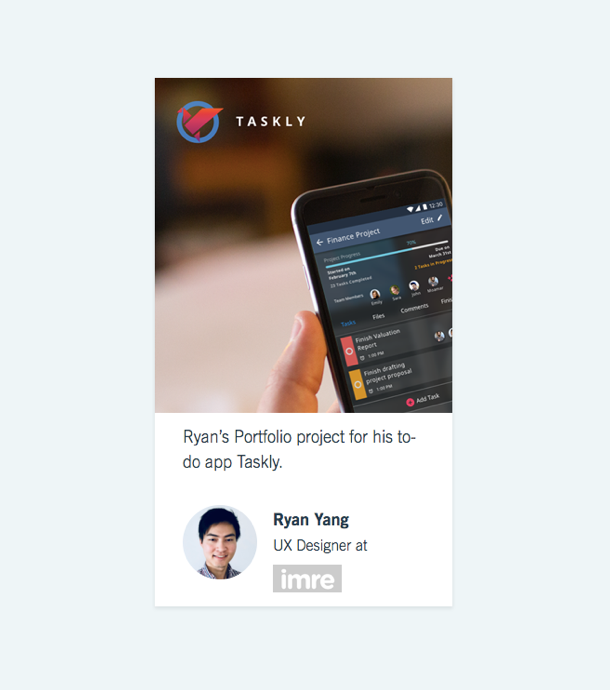 After I finished and published my first portfolio piece, Taskly, I was overwhelmed by all the positive support from friends and peers. Posting it on my resume allowed recruiters to gain interest and contact me. What was it like to start your first job in tech? My first job in tech was actually in a start-up company, which had a really young and enterprising spirit. New ideas were born every day and everyone was receptive to change. Coming from the accounting/financial industry it just blew my mind how fun and laid back the work environment was. It was definitely also challenging, as I was the sole UX designer for a while and had to figure out everything without a mentor. 1) Being able to question everything and think outside of the box. It is such a relief to escape regulatory-based work and use the creative process to improve the world. I don’t have to see things at face value and instead can question and imagine how things can be improved - because there will always be room for improvement. 2) The ideas that I propose and the designs that I or my team create has a tangible effect on the world and how people interact with technology. I have more outreach than ever before, and what we do in UX can define the next generation of user interactivity. It’s a beautiful process and a humbling one to respectfully design for our users. 3) I feel intellectually free now. As someone that has spent the better part of his childhood dreaming of being this or that, I never really knew what I wanted to do with my life. There are so many interesting things to explore and work on in this world. With UX, however, it’s practically needed in every industry - which means I have the flexibility to explore work in different industries. The possibilities are endless! A year and a half ago I would’ve said financial consultant in an investment bank. Today I picture myself as a Senior Product Designer 5 years from now - perhaps working in San Francisco or another large city with a vibrant tech scene. Ryan’s story might sound like one of a kind, but his initial predicament is all too common: according to a Gallup survey conducted last year, around 85% of the global workforce are unhappy in their careers. It’s a pretty gloomy statistic, but it’s never too late to turn things around. As Ryan says, the possibilities are endless, so chat to a Careers Advisor today.